Our Steakhouse Potato Stacks with Rosemary were being served alongside Steak au Poivre long before I even ventured into the kitchen, some 35 years ago. An easy, yet elegant way to serve up a simple potato. Created by alternating layers of potatoes, with onions, rosemary, Parmesan, and a topping of quick garlic cream sauce. In a heavy-duty muffin or popover pan. They’re a real Serious Mmmmmmmmmm encounter! The best news is you can use any potato that you have on hand, pictured are pink and sweet potatoes. But you can easily use any variety you have on hand! If you do use sweet potatoes, they reduce in size significantly, so figure that your filled tin will reduce by nearly half as they cook. Also, make sure that you only add about a tablespoon of the garlic cream sauce. It bubbles as it cooks and may spatter out from under the tinfoil causing some smoke. It’s normal, just keep an eye on it. Use your senses as you cook, smell, sound, sight all come into play! If you think something is cooking to hard and fast than it probably is, reduce the heat and make adjustments as needed. How do I get uniform slices when cutting potatoes and other veg? We recommend that you purchase a Mandoline Slicer. Always be sure to use the guard while cutting!! We may eventually promote and sell products on our site, but to keep your browsing experience fast we have opted not to do so at this time. For now we’ll share the best reviews for 2019. 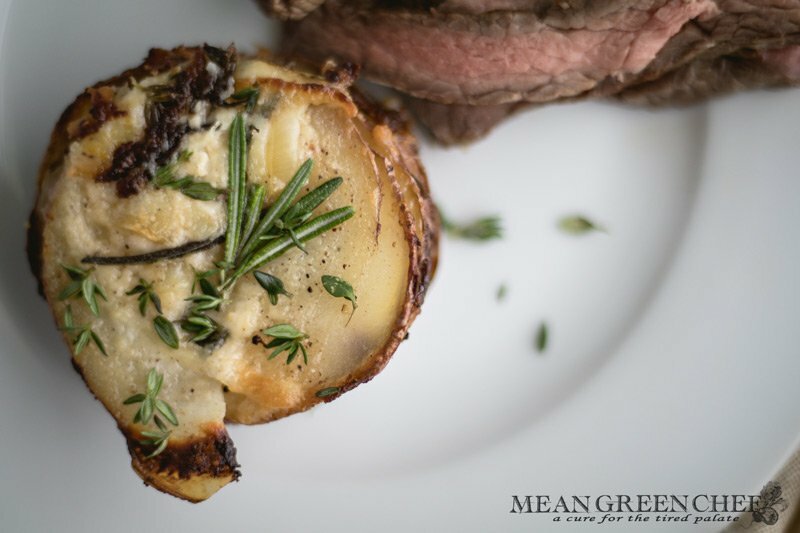 Our Steakhouse Potato Stacks are created by alternating layers of potatoes, with onions, rosemary, parmesan, and a topping of quick garlic cream sauce. Preheat oven to 375F. Butter the sides of a heavy-duty popover or muffin pan. Scrub and peel potatoes if desired, we peel or sweets and leave the skin on other varieties. Slice the potatoes and onion into thin slices on a mandoline (please use the guard to avoid serious injury). You can slice by hand but thickness will vary and may affect the consistency of the dish. Heat the cream, crushed garlic cloves, nutmeg, Kosher sea salt and freshly cracked black pepper in a medium saucepan over low heat for 5 minutes. While the cream mixture warms, layer the potatoes. Alternating, potato, onion, Parmesan, and Rosemary and so on and so forth until the tins are filled equally. Remove the cream from the heat and stir, spoon 1 Tablespoon of cream mixture onto each of the potato stacks. Cover with heavy-duty aluminum foil and bake for 35 minutes. Remove foil and allow to brown another 7-10 minutes. Alternately you can turn the broiler on for 1-2 minutes to crisp the top. Or use a butane torch to fire it until browned and crisp. Remove from the oven and allow to sit for 5 minutes before plating and serving. Potatoes will store in the refrigerator up to 3 days. If you have some Butternut Squash that you need to use up, take a look at our Butternut Squash & Thyme Recipe!